Ukrainian President Petro Poroshenko has said that he signed the Bankruptcy Code. "I have one more piece of good news. 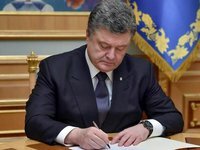 Today, I have signed the law on bankruptcy," Poroshenko said at a meeting with business representatives in Kyiv on Monday. As reported, Ukraine's Verkhovna Rada on October 18, 2018 passed the Bankruptcy Code of Ukraine (bill No. 8060). This book provides an opportunity for individuals - bona fide borrowers in the event of a difficult economic situation to initiate a bankruptcy procedure and get rid of this debt obligation, while the lender is deprived of this right. The adopted document provides for the sale of bankrupt property at transparent electronic auctions of the ProZorro.Sales platform.